The goals of the vertebroplasty surgical procedure are to stop the pain caused by a compression fracture (often resulting from osteoporosis), to stabilize the bone, and to restore some or all of the lost vertebral body height due to the compression fracture. A vertebroplasty is usually done for an older patient who would not easily undergo general anesthesia. 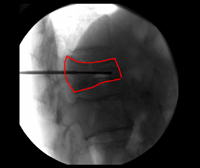 What happens during the percutaneous vertebroplasty procedure? The procedure involves placing a small needle into the crushed bone. A bone cement is injected into the bone to secure it. Several crushed bones can be treated at the same time. Your doctor guides the needle into position using special X-ray equipment. Therefore, open surgery is not needed. The procedure takes about 1 hour and is usually done using only numbing medicine. Some patients who are in severe pain may need extra medicine to make them sleepy. Usually, patients can leave the hospital a few hours after the procedure is done. What should I expect after vertebroplasty? In the United States, 75-90% of people treated with vertebroplasty will have complete pain relief or significant reduction of their pain.